Breakdancing In The Olympics? Paris 2024 Organizers Say, 'Oui, Garçon!' Discussing "le breakdance" this week, Paris organizers said it speaks to young people — and that the sport's dance battles will be a hit in the 2024 Summer Games. Paris Olympics organizers want breakdancing to be part of the 2024 Olympics. The sport was part of the Youth Olympic Games in Buenos Aires last fall, when Russian b-boy Bumblebee (left) defeated Japan's b-boy Shigekix in the gold-medal battle. 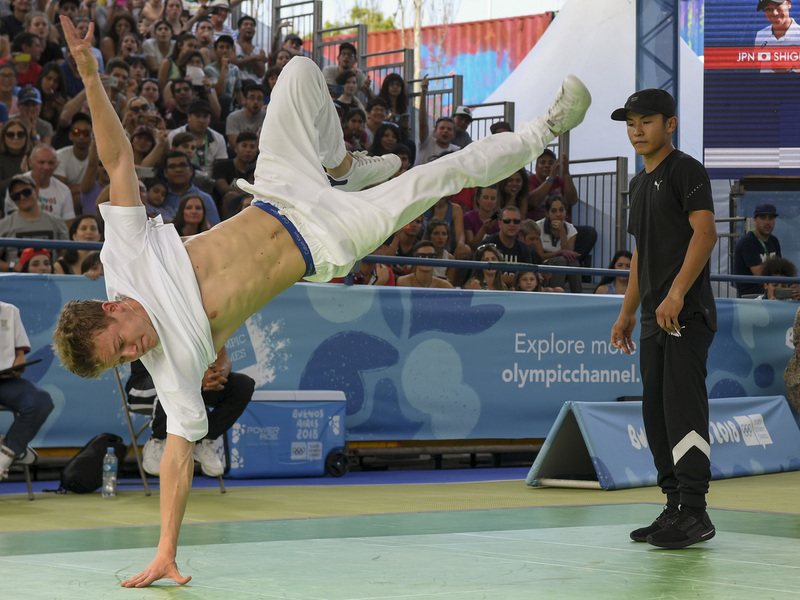 Breakdancing was part of the Youth Olympic Games in Buenos Aires 2018, with participants competing as b-girls, b-boys and on mixed teams. At the Olympics, the discipline would be known simply as "breaking." In Buenos Aires, the b-girls competition was won by Ram (Japan's Ramu Kawai), and the b-boy's medal was won by Bumblebee (Russia's Sergei Chernyshev). "The Paris organizing committee also wants to include climbing, surfing and skateboarding, which are already on the roster for the 2020 Tokyo Games," Jake Cigainero reports for NPR's Newsdesk. "Karate will also make its Olympic debut in Tokyo, but Paris snubbed the sport for its lineup." In breaking battle competitions, judges vote to decide the winner of multiple rounds of dancing, in which two dancers take turns on the floor — with rivals often doing their best not to look impressed with their opponent. Discussing "le breakdance" at a news conference on Thursday, Paris organizers said that it speaks to young people worldwide and that it has more than 1 million practitioners in France — second only to the U.S. Praising the dancers' acrobatic ability and innovation and the dramatic suspense of battles, organizers said it would offer a completely new type of competition at the Olympics. If breaking does become an Olympic sport, the dance style that has its roots in New York City's streets will achieve a status that ballroom dancing aficionados have been pursuing for years. That effort has been led by the World DanceSport Federation — which now finds itself celebrating the inclusion of a different discipline. "It is an incredible honor and privilege that, for the first time, a dance discipline is being considered for inclusion in the Olympic Games," said WDSF President Shawn Tay, adding that breaking would be "an outstanding success" in Paris. The Paris committee's decision to back the four new arrivals means that baseball and softball will be left out of the Paris Olympics, after a brief return for the Tokyo Games. Squash is also shut out; so are chess and snooker, which were seen as facing long odds to become Olympic sports in 2024. While a gritty sport that started in the U.S. has a shot at being in the Olympics, a gritty and acrobatic French sport — parkour — was left out of the Paris proposals. As NPR's Laurel Wamsley has reported, the International Gymnastics Federation has increasingly sought to bring parkour under its purview and reportedly lobbied to make it part of the 2024 Games. Paris organizers predict the new sports will boost the Olympics' appeal to a younger generation that might not be transfixed by more traditional sports. While they sketched out how the competitions would be held in 2024, final details about the proposed sports aren't likely to emerge until after the Tokyo Summer Olympics in 2020. The International Olympic Committee will review the Paris group's proposals, with an initial decision possible in March, when the Olympic Program Commission is slated to make its recommendation to the IOC Executive Board. Final approval could come in June, when the IOC will meet in Lausanne, Switzerland.